This year it fell to British space rock greats Spacehead to kick-off the day on the main stage at Roadburn. As expected the new, invigorated line up more than rose to the occassion. As a big fan of the band for many years it was very exciting to get to see them front and center on the main stage, bathed in the glory of the Roadburn light show. The crowd swelled as they performed, and I'm sure its fair to say they made converts of a whole bunch of new fans. If you want an idea of what all the excitement is about, I'd recommend their latest CD on the Voiceprint label "Live At Hawkfest", which also features Hawkwind's Dave Brock as a guest musician. Spacehead mainman Mr. Dibs was kind enough to sit still long enough to be interviewed for Aural Innovations. Here's what the man had to say. Eli Friedman (EF): What is the current line up of Spacehead? Who will be appearing in the band at Roadburn? EF: Next I have a question that I'm pretty sure has a complicated answer. I think that even the serious space rock fans are confused about the origins of Spacehead in terms of its connection to the band Krel, who opened for Hawkwind on tour many years ago. Can you explain who has roots in Krel and what the connections and overlap in membership between the two bands is, and has been over the years. Mr. Dibs: Well, I (Mr. Dibs) left Krel around 1995 and almost immediately wanted to get back into some form of band. I knew a guy called Phil Howard who was a keyboard player, so enlisted him to help produce a cassette album. The name came from a review of Krel in a Manchester (UK) magazine which said, "Meaty, beaty, big and bouncy, these truly are the original spaceheads". Hence Spacehead! (There was already an acid jazz outfit called The Spaceheads in Manchester at the time). That tape was Sentinel. Phil went on to play some keyboards for Krel for a short time. 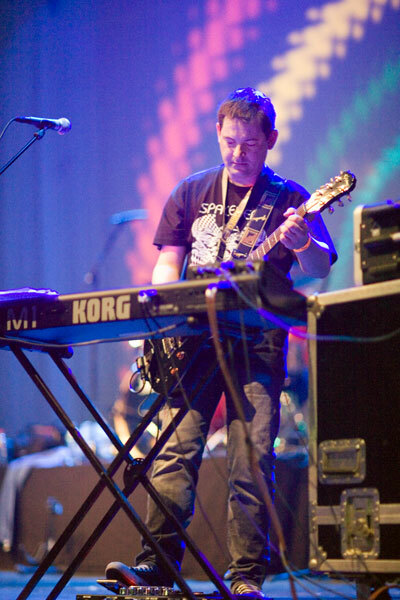 Martin M guested with us in 1997, and of course, the current Spacehead has the old Krellian synth man, Mr. Floyd, who joined a couple of years ago. EF: The first Spacehead release most of us got on CD was "...Of Stars and Time", released on Hawkwind's EBS label. 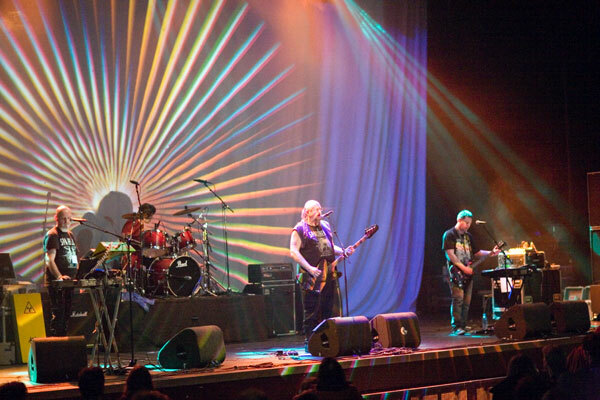 How did you get involved with Hawkwind and how did they end up putting out your CD? Mr. Dibs: I had sent The Captain a copy of the Sentinel tape, which he really liked, and rang me to ask if we'd like to put something out on EBS. 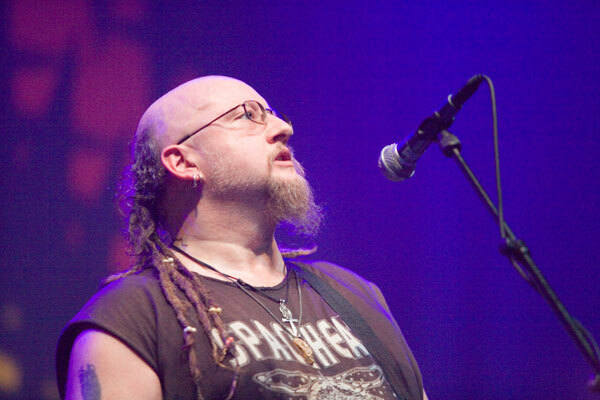 He'd been aware of us through the Krel connection, as Krel had supported Hawkwind on the 1992 Electric Teepee tour. So EBS put out the album in 1995. Then fast forward 2 years and I had gone to see the band at Whitby Dracfest early that year ('97). The day after the gig I was backstage chatting to the band when Richard (Hawks drummer) said something like "'Ere Dave, Dibs can drive a bus! ", so I ended up driving an old hippy bus with Richard, Crum, and Captain Rizz on board for the 1997 Welcome to the Future tour. I also hepled out on the merchandise stall and it quickly became apparent that you needed many skills to be on the road with Hawkwind, and I dubbed the crew "The Multi-Role Combat team!" After that tour I started to become more involed with the equipment setup, still driving the vans, becoming bass tech later on, and to the present, even occassionally invited onto the stage to sing or play bass! EF: Back in 2002 the band remastered "...Of Stars and Time" for CD rerelease. The remaster has better sound quality, a bit nicer mix, I thought, and some nice added tracks. What motivated the revisitation? Mr. Dibs: Well, I had finally mastered the art of the PC, so I was keen to archive everything (which I am still doing!!). It seemed the right time to redo the whole thing, clean it up a bit. I didn't have any multitrax to play with, but i did have a copy of the original master, so I digitised it, and remixed it with a copy of the actual EBS CD, without Phil Howard's tracks, and some new and live bits from more recent times. EF: I know that fans really enjoyed the live material on the two Dead Ernest compilations, "In Space We Trust" and "Explode Into Space". Do you have more live archival material you might release in the future? Mr. Dibs: There is a heap of live and studio archive which I've just started ploughing through again, and I will cherry pick the best, so, yes, there will be more of that kind of thing. EF: How did violinist Graham Clark (of Gong band family fame) get introduced into the band? During what time period did he play in Spacehead and what was that like for the guys in the band at that time? Mr. Dibs: I have known Graham for many years now through attending Gong shows, and I had moved to a town called Buxton in the beautiful county of Derbyshire. They have a festival of arts and music similar to Edinburgh, and had gone along to see a show by my then girlfriend's mother. As I waklked into the venue I was stunned to hear a familiar sound, the sound of violin that I knew so well. "That's Graham Clark!" I cried, and sure enough, there he was. Turns out he's also moved to Buxton just recently, what luck! He has guested many times, firstly on violin, and most recently on lead guitar, an instrument he is most proficient on. So I guess he's a bit like a floating member of the band, playing when and where he can. This man, in my opinion, is the greatest violin player of our time, so you can imagine how it feels to have him onstage with us! I regularly tell people who ask what he does, "He makes the wood sing". That's Graham Clark folks! EF: At one point Spacehead put out an EP called "Escape Velocity Preview". There were 3 strong new tracks and a cover of Hawkwind's "Blue Skin". It semed to herald a longer release. What happened to the follow up? Mr. Dibs: Well, that old chestnut, line up changes is what happened to that one! (Although I do have all the demo versions of the intended tracks, so you never know). EF: Your most recent release on the Voiceprint label "Live At Hawkfest 2003" features sparkling sound quality and some very special guests. What's it like to perform with the captain of spacerock, Dave Brock, and what are your recollections of that gig? Mr. Dibs: Wow! You turn round, and there he is! The Captain! Grinning in that enigmatic way he has. What a great festival it was, all those bands on one stage over a three day period, and your hero onstage with your own band, doesn't get much better than that you'd think..... later in the day I find myself onstage, playing bass with Hawkwind on three or four tunes!!! To say I was a bit "giddy" afterwards is an understatement. So was keef, as he'd also been onstage with them playing guitar! Woohoo! EF: What's next for Spacehead fans to look out for? Any gigs after Roadburn? Any new CD's in the pipeline? Mr. Dibs: We are hoping Roadburn will get us into the European mainland to do more gigs. We are rebuilding our website at the moment and getting our heads round the online store thing.... and a brand new album out by the end of the year. There are gigs in the pipeline but nothing solid just yet. Watch out for anouncements etc as soon as we know. EF: What are you looking forward to most about your trip to Holland for Roadburn? Mr. Dibs: We're looking forward to playing on a big stage. We have quite a massive sound at the moment so it will be good to stretch our legs, as it were. And I'll be catching up with old friends and making lot's of new ones! EF: Are there any bands playing the festival that you will try to see? Mr. Dibs: I'd love to catch Brant Bjork, and Orange Goblin are one of my favourites, so if I can do that I'll be a happy bunny!